The company is staying true to its big screens only approach with a series of extremely large sets. Mitsubishi's mantra going forward - at least where televisions are concerned - is "the bigger the better." They're focusing exclusively on large sets, like the new $5,999 92 inch Diamond 840 3D DLP. Of course, if 92 inches it too much, you can get an 82 or 73 inch version, but if you're going part of the way, why not go all out? 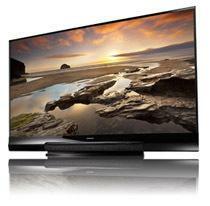 If you're looking for something a bit more reasonable, the Mitsubishi 740 series offers 3D, over 100 applications including Vudu and is available at 73 inches ($2,099) and 82 inches ($3,499). Going a step down from that is the 640 series, which keeps the 3D but ditches the networking and comes in at $1,599 for 73 inches. At the top of the line is the latest LaserVue, which boasts Vudu, built-in WiFi and a 75 inch large Clear Contrast screen. You can pick it up this month at $6,999.